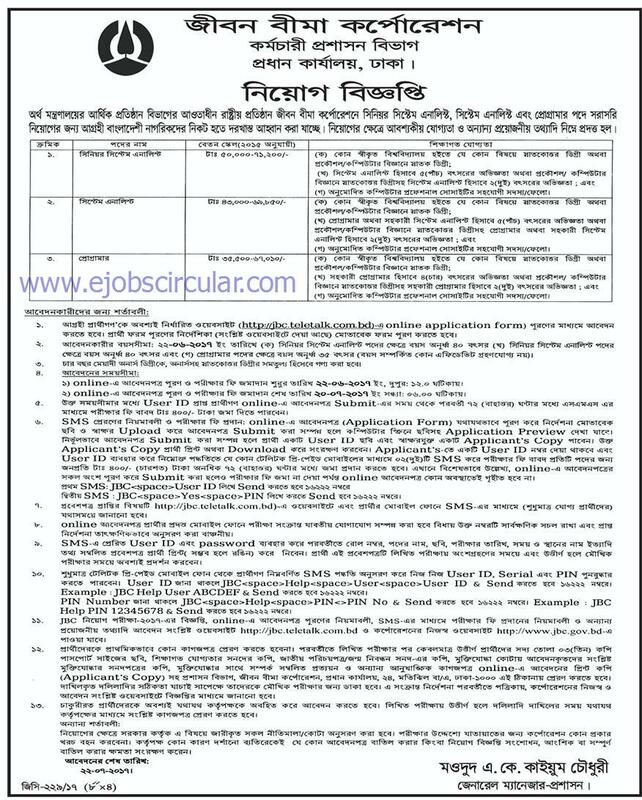 JBC Job Circular Selection Process : The candidates will be selected on the basis of written or computer based exam and skill test/interview. JBC Recruitment Application Fee : Candidate should pay 400 TAKA through Teletalk Mobile SMS. Age Limit : Candidate Age Limit should not exceeding 40 years for the post senior system analytics. 35 years for programmer post. For more age details see the circular. Eligible candidates may apply online through the website www.jbc.teletalk.com.bd from 22-06-2017 to 20-07-2017 by 06:00 PM. 6. After submission, take print out of online application form for future use. Senior System Analytic`s Bachelor’s Degree from a recognized University. For post wise details, see the notification. System Analytic`s Bachelor’s Degree from a recognized University. For post wise details, see the notification. If You want to apply www.jbc.gov.bd you have to visit there official website . You can Also download Jiban Bima Corporation Job Circular Application Form at ejobscircular.com . For Next Updates about Jiban Bima Corporation job circular,Notice,Exam Result or Admit card Download stay with us.